Along with April Fool's Day, April 1 marks the beginning of National Poetry Month. 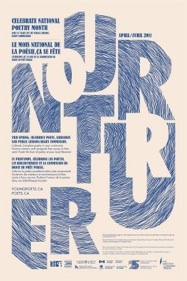 This year, the theme is Nurture/Nourrir, and is about nurturing interest in Canadian poetry and the institutions and people that make it available. For NPM last year, I wrote about a different aspect of Canadian poetry every Friday in April. This year, I am taking it up a notch and will be reviewing a different collection of Canadian poetry each Monday in April. Happy National Poetry Month! It will get properly underway on Monday with a look at Griffin Prize winning poet Karen Solie's second collection of poetry, Modern and Normal; so, come back to celebrate Canadian poetry with me. There's also the LCP National Poetry Month blog, which posts three poems a day in honour of NPM! happy belated national poetry month!! I know its very late.. but better late than never. I like the look of your page, keep up the great posts! !